To look fashionable for plus size is not difficult to have when you find perfect outfit. It’s because the perfect size is comfortable to wear and make you more confident. You can wear your favorite outfit such as jumpsuits, skirts, or jeans with your favorite color. Don’t hesitate to apply bright color as one of the efforts to look chick and stylish. Here, you’ll find some tips and ideas to look fashionable. To make your legs look longer, a pleated skirt is nice to wear. When you wear under knee skirt it’s fit to combine with ankle tied. 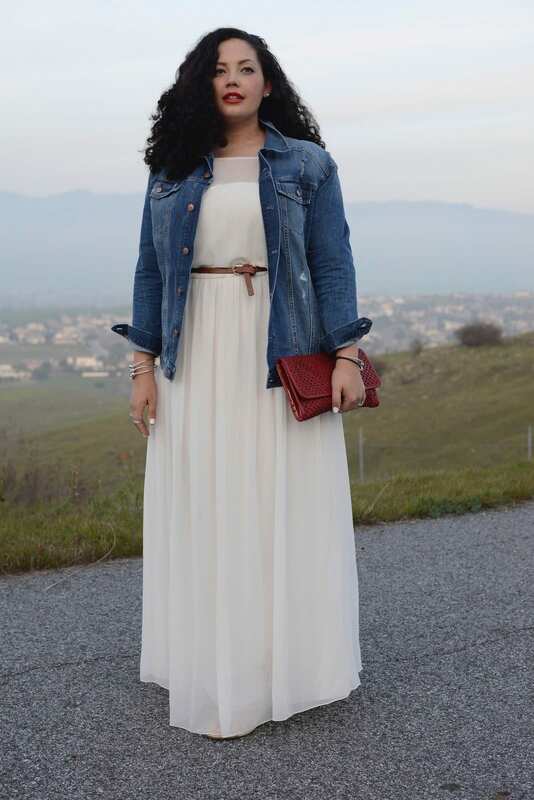 Wearing white long dress combine with denim jacket is fit for you. The long dress will make you look taller and graceful. To balance your dark outfit color, white is best for the inner. Adding a statement necklace is nice for your look. This pink flowery jumpsuit is so beautiful on you. Add a tiny belt so that your waist looks narrower. 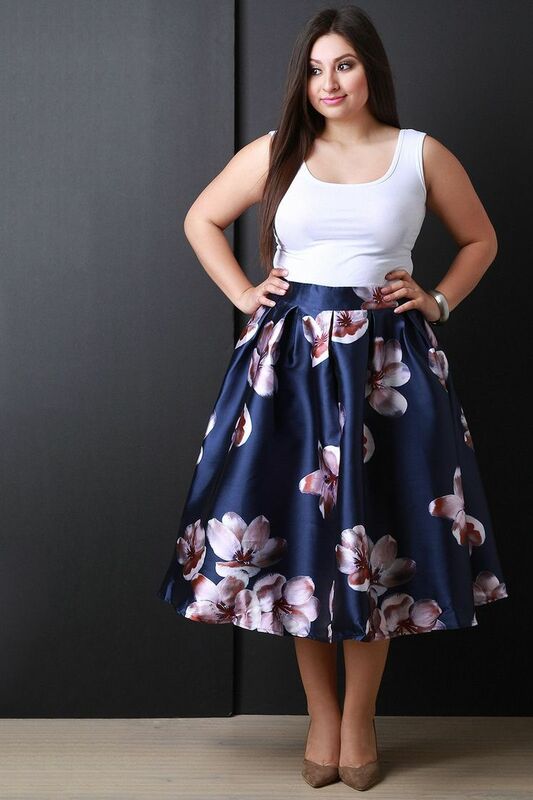 Navy skirt with copper flower patterns look so fair and lovely when combine with white tanktop. The highheels is also fit to be combined with the midi skirt. When you wear a plain dress, a statement necklace is a very suitable accessory. Choose a dress with a v-neck model because it allows your statement necklace looks perfect on your neck. 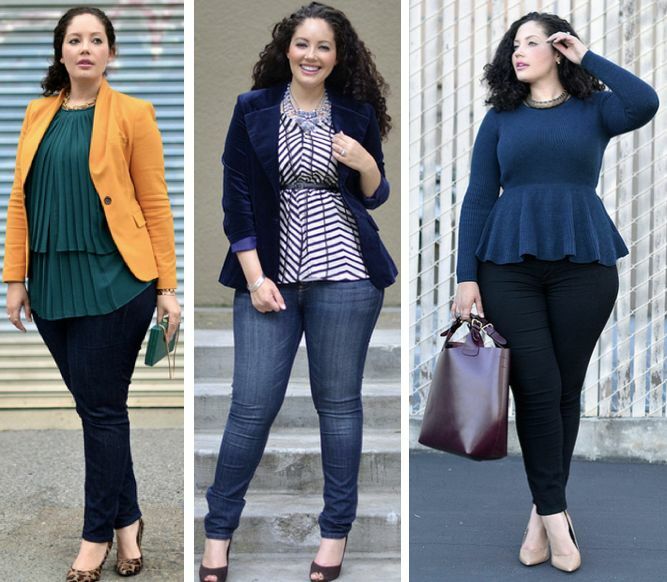 To make your waist looks narrower, peplum blouse is best for you. You can combine it with jeans or if you like mini skirt, it’s also fit with peplum blouse. Denim skirt is also fit for you to look fashionable and chic. It can be combined with suitable black blouse. To create a beautiful body shape look, insert the blouse into the skirt so that your waist looks narrower. Special for plus size, a vertical stripe dress is better than horizontal stripe. It’s because the vertical stripe can make an impression of slimmer body. Withal, tiny stripe is best for plus size.